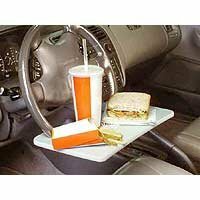 A very SkyMaul-ish product, that sort that seems designed to elicit mock reviews on Amazon and violate any number of Michael Pollan’s “food rules.” Needless to say, not be used while driving (that’s what your legs are for, after all, to hold french fries — and keep them warm). And speaking of SkyMaul, did you see the first product on the list of other things customers who purchased this item purchased? Poop Freeze Aerosol Spray. Wow. This entry was posted on Saturday, October 10th, 2009 at 8:11 am	and is filed under Traffic Culture, Uncategorized. You can follow any responses to this entry through the RSS 2.0 feed. Both comments and pings are currently closed.